Share your experiences with Gixxer? Q. Is there any issue with gear shifting on Gixxer? I heard lot that gear shifting is not that smooth on Gixxer as other competitors. No, I Have not observed it, using for last 3.5 years. There is no problem with the gear box, it's just the character of Suzuki bikes. Every gear shift gives a mechanical feel, it's the same in their big bikes to some extent. Q. What is the difference between ABS single channel and double channel?? Single channel abs work only in front wheel and double channel abs work both the front and back wheels double channel abs is better than single channel abs. Q. What will happen if I use 55 w HID kit in my Gixxer though it's battery is 12 v,3Ah? Q. Is it good for 50kg person? Q. Is Fi variant available, if available then in which model? No, FI isn't available in Suzuki Gixxer. However, Gixxer SF gets FI fuel supply system. Please Tell me about FI .. actually what is mean That ( Full Form of FI ) ? 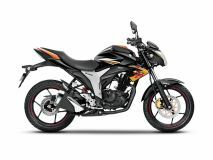 Suzuki enters the premium 150cc motorcycle segment with the new Suzuki Gixxer 155. Can it stand tall to its legendary name? On, paper, where does the newly launched Honda CB Hornet 160R stand against the Suzuki Gixxer and the Yamaha FZ-S FI?